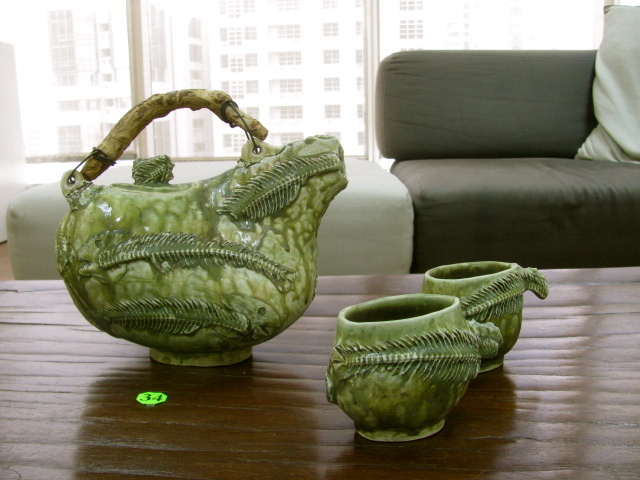 Philippine Pottery – CREATE. PLAY. TRANSFORM. 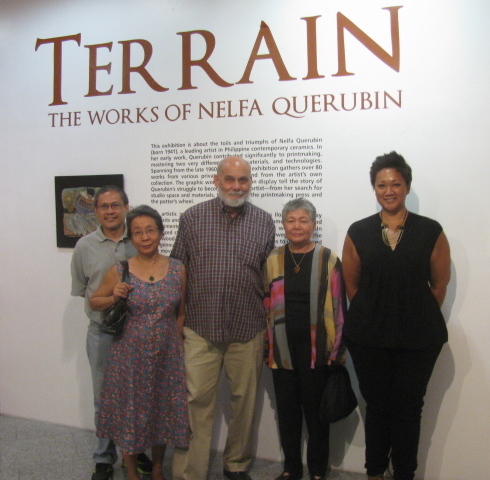 It did not take another week to see more of Nelfa’s works in Manila. 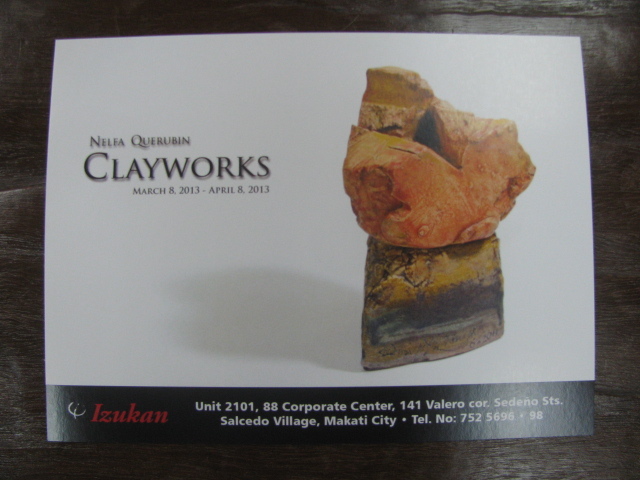 After three days from the opening of “Terrain” at the Ayala Museum, comes “Clayworks”, an exhibition of Nelfa’s most recent works in clay at Izukan Gallery in Makati City. Nelfa has paddled through calm waters and wild waves of trials in her life as a daughter, auntie, Ceramicist, and a friend. Challenges in life did not stop her from traveling through the ups and downs of the realities that come into her everyday life. Through these, she discovered her spirituality, and deeper sense of meaning in her life, which continue to mold her until today. 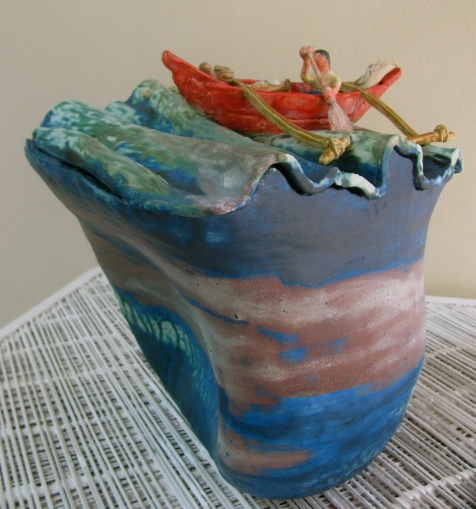 After forty years of being a Ceramic Artist, one has mastered techniques in forming clay and glazes. 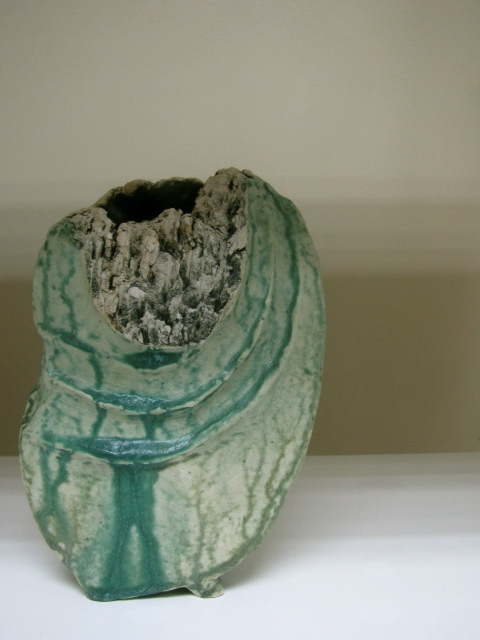 Looking at all of Nelfa’s works, I feel her emotions: The enthusiasm in slicing her clay with a sharp knife. The frustrations of looking for the perfect place to create pots. 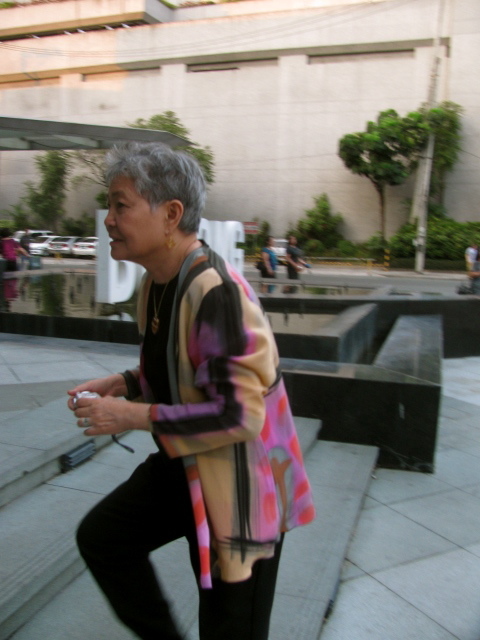 The sweat from too much heat, crawling down her neck, from her earlier years as a Potter in The Philippines. The chills she gets from very cold Colorado. Her struggles with sickness from her respiratory problems. 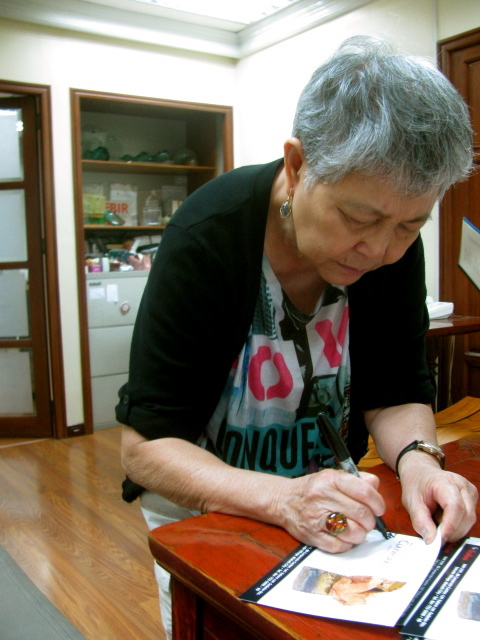 Her drive to travel back and forth from Denver to Manila almost every year. The sleepless and prayerful nights she has experienced through trials and joys in her life. The sadness from losing her mother. Her success in winning awards, joining group shows, and having her one-woman-shows. 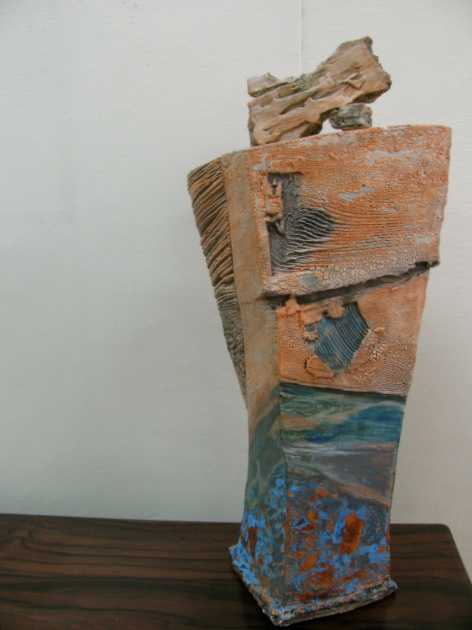 Her strength and overwhelming happiness as she creates big pieces with slabs of clay. Her weakness as she centers a one-kilo lump of clay in her 70’s. Her longing to love and be loved. Her contentment in finding the one who transforms her life day in and day out. All these are seen in the works of a great artist, Nelfa Querubin-Tompkins. Someone in this world worth meeting. Thank You for your generosity, Nelfa. All things start somewhere. The first stroke of a paintbrush, first photograph, first painting, first sculpture, etc. Nelfa started her artistic career as an illustrator, architectural draftsman, cartographer, graphic designer and printmaker. 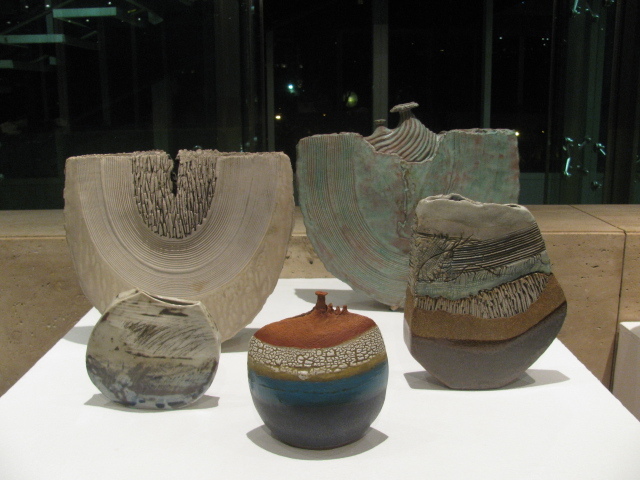 All these different practices influence her works in clay. 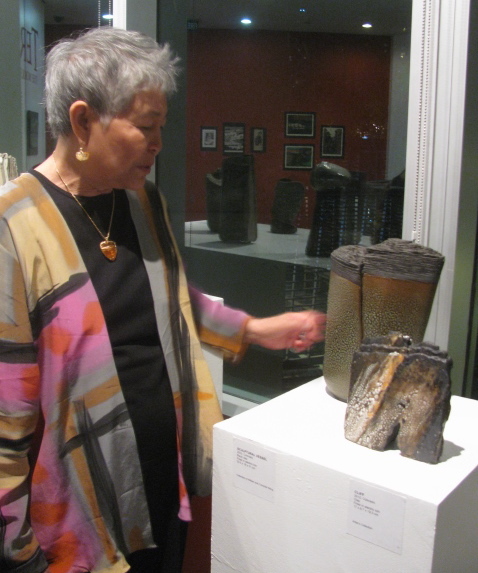 Nelfa Querubin-Tompkins started forming clay between her hands in 1973 in Miag-ao, Ilolilo City, Philippines. A daughter of a fisherman and a housewife, poverty did not stop her from pursuing making pottery. At the age of thirty three years old, her curiosity for making pottery, became her life’s passion, which continues to support her until today. Pottery supported her, not only financially and mentally, but above all, spiritually. 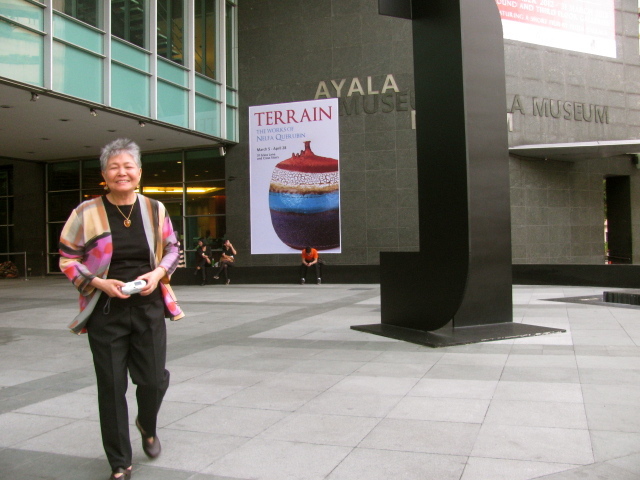 Forty years later, her collected Ceramic Art pieces by her collectors from around the city, are shown at the Ayala Museum in Makati City. 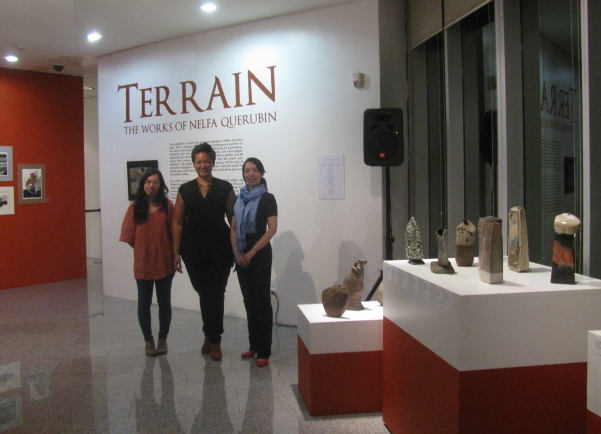 “Terrain”: A retrospective show in Ceramics by Nelfa Querubin-Tompkins from 1973-2012. A must-see show! 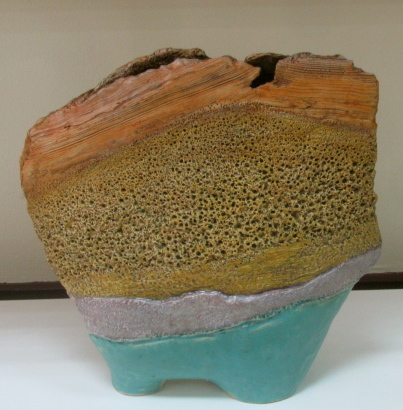 It is an honor to be asked by a celebrated Ceramicist, to pick her up from the University Hotel in U.P. Diliman, Quezon City. She was wearing a black pair of pants, black inner shirt, and a very colorful, long-sleeve, chiffon top. The colors pink and orange are popping from the black shirt underneath. With her salt and pepper hair, she carries herself with confidence, pride, and peacefulness in her eyes. She is strong. She is meek. She is quiet. She is loud. She is simple. She is complex. She is a little girl with a child-like faith. She is an old lady with a deep source of wisdom which comes from her spirituality. She is an inspiration. All these and more, you will see in her works with clay, and writings in her books. I escorted Nelfa into the hall which shows all her works. White and red pedestals with her Ceramics, were all waiting for people, to see them one by one. Her handmade pieces draw the crowd to come close. The first set of pieces that caught my attention were these teapots for two. Nelfa plays a lot with texture. 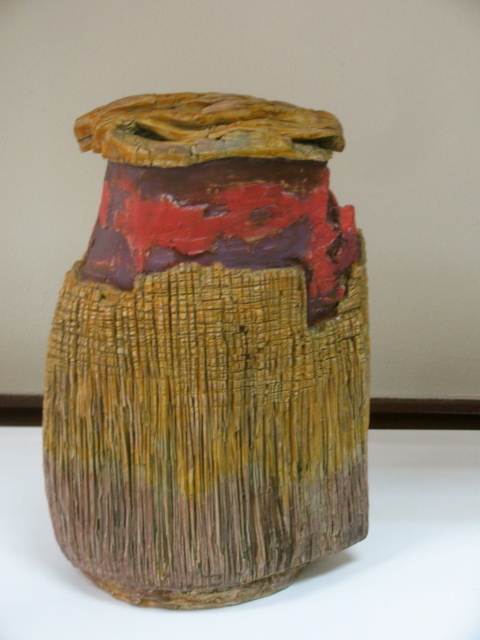 Influenced by her surroundings, she marks her clay with organic and non-organic materials that she finds from the ground, by the beach, through her travels, etc. All teapots were made with the slab-making technique. Nelfa currently lives in Denver, Colorado with her husband Michael Tompkins. She is surrounded by rocky mountains, which highly influence her works here. Michael gave Nelfa, a special kind of knife, to apply these texture to her clay. Her environment plays a big role in her creative process. 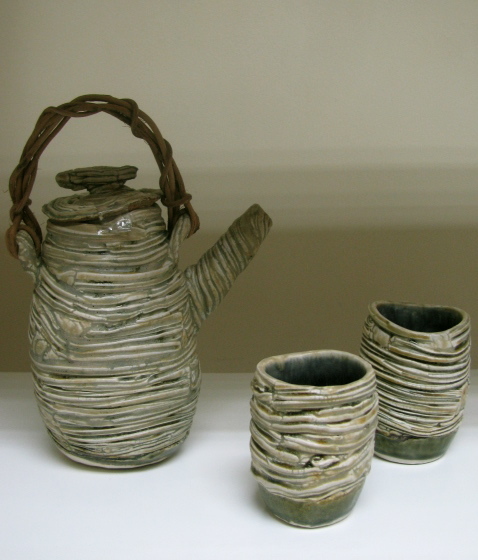 Her pieces are not just glazed pots. Her works are inspired by what she sees around her. 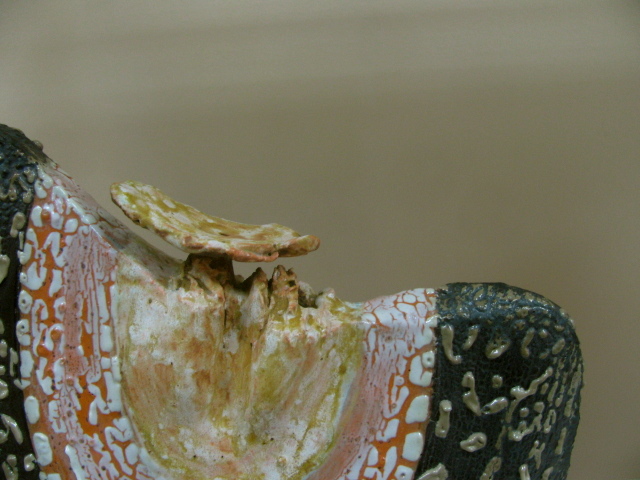 She incorporates form and texture to her Pottery. When Nelfa is asked about her techniques in making Pottery, she answers them generously. Nothing is hidden. Nothing is held back. Ideas are meant to be shared. Application will never be the same. This is the beauty of working with handmade pottery. No two pieces are ever alike. 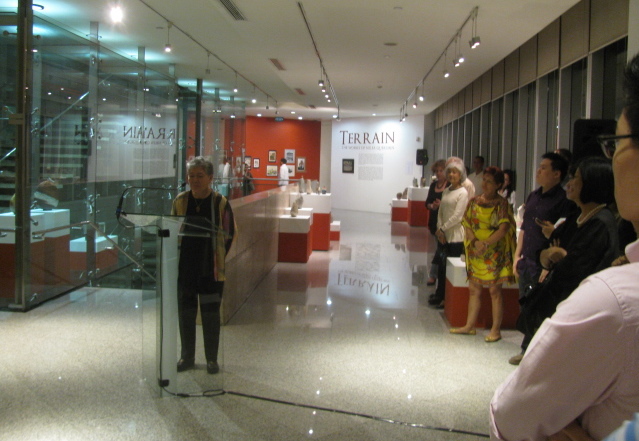 To be in one place with fellow potters and pillars in Philippine Pottery is unexplainable through words. These are some of the people who influence us today in the world of Ceramics. They are the reason why we continue to play with clay today. Jon, Tessy, and Nelfa, have gone through most of the struggles and success, a Potter goes through in his/her career as a lover of clay and fire. We are all transformed. Wherever we are today, whether we are in Manila or in the provinces in The Philippines, working with terra cotta, bone china, or stoneware clay, we continue to share and spread the love for Pottery. It is a good way to express one’s self. Fired clay lasts for a lifetime. We are all hooked. 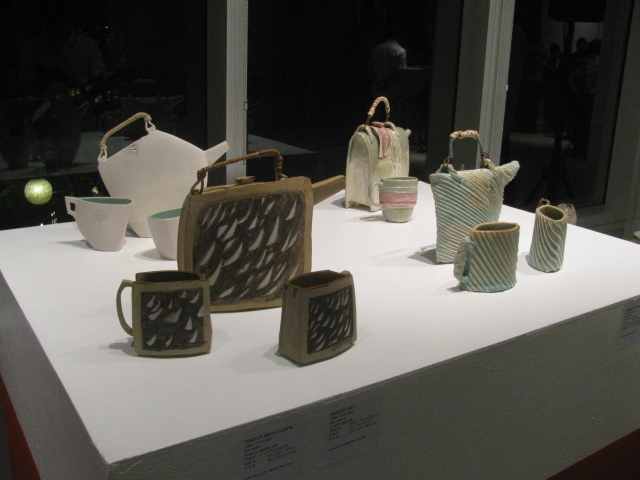 Witnessing a retrospective show in Ceramics, has confirmed my joys and fears as a Potter. 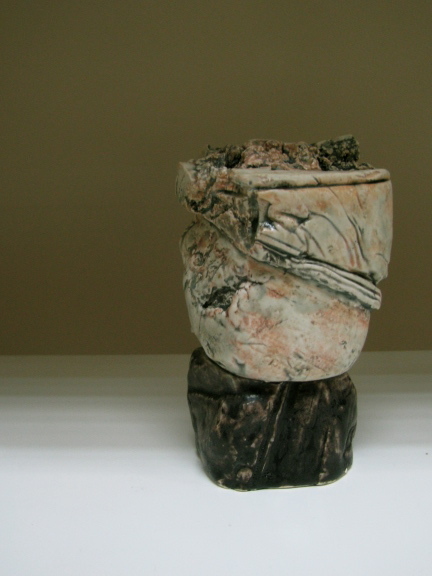 Seeing the pieces of Nelfa, when she was starting as a Potter, shows her honesty and boldness with what she created from 1973-2012. She didn’t think whether people will like her work or not. She went right ahead in her studio, picked up her tools, slapped, poked, sliced, glazed clay, and fired her pots with strength, weakness, joy, sadness, and a fired-up passion for transforming clay.